Hostel is right on the shore line, lots of communal space - and homely dinners cooked in the evening. Was a really comfortable place to stay. We had the castillo dorm, which was cold and windy in particular beds because of the mesh wall so we ended up sharing beds. Apart from that, was good atmosphere and worth it for the food !! This is a great hostel, one of the best I've ever been to. 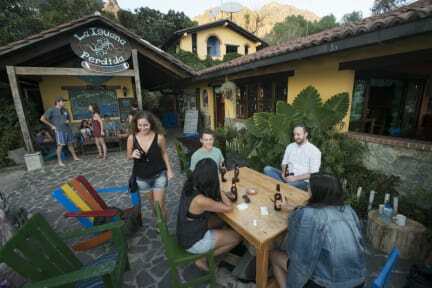 It is located right on Lake Atitlan with amazing views, adjacent to the boat taxi dock and a few steps to a swimming dock. They have a bar/cafe/restaurant that I'd recommend visiting whether or not you stay the night. We stayed in a treehouse-like room with an a-frame roof and a balcony that was super cute and comfortable. The whole property is covered in lush beautiful landscaping. Staff were friendly & hostel guidebook had great tips. Best hostel I stayed at in Guatemala. All the volunteers working there are awesome and super social. The view from the hostel is really nice. Family style dinners are a great way to meet people. Lots of dogs wandering the property. Dorms are a bit basic (no locks) and showers aren’t really hot, but it’s good enough, and the atmosphere more than makes up for it. Great place to go unplug and chill out for a few days. Very nice & helpful staff. Location is beautiful and atmosphere is relaxing and fun. We stayed in a private room and it felt like sleeping in a cool treehouse. Highly recommend. NEVER hesitate to come here! La Iguana Perdida is the perfect place, a piece of paradise! Everyone here is so friendly, the rooms and accomodation are basic but are scattered throughout wonderful, well-kept gardens, the view on the lake couldn't be better, and the food is great! Not to mention the owners, Dave and Deedle, who are so dedicated to helping the local community. I would not hesitate to come back! Great location and view! Fantastic views! I think it was an amazing place to stay and I highly recommend. My only critiques: The bunk dorms are dark, no hot water for showers, and the property is open so security isn't really a thing but I didn't have a problem. But I would still stay here again purely for the food and view! Awesome place! One of my favorite places and hostels through all my travels. The family style dinner is delicious and a great way to meet others and enjoy company, the staff are super laid back and helpful, and the property itself is gorgeous! I split my time doing various activities and reading in a hammock with a Gallo in hand - this place is pretty much paradise. Only slight drawback is lax security - take precautions and don't forget it's a hostel and you will be fine.